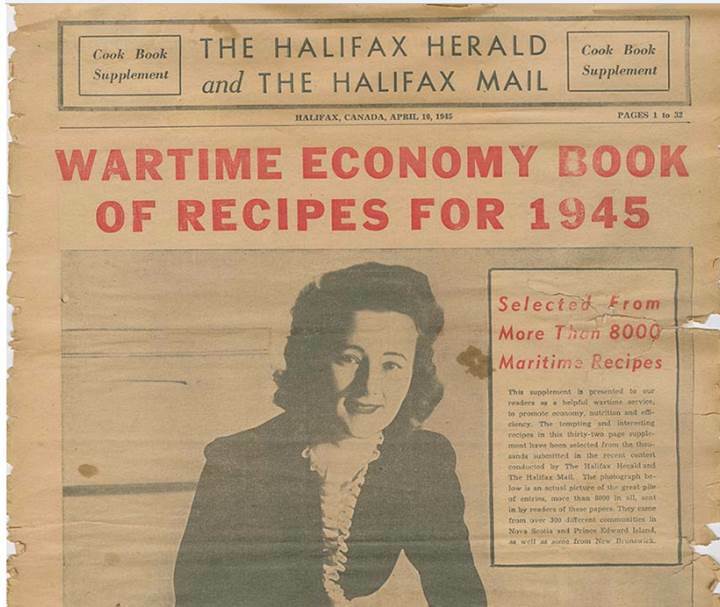 The Wartime Economy Book of Recipes for 1945 was published on April 10, 1945. The recipes were “selected from more than 8000 Maritime recipes” submitted for consideration. Over three hundred different communities from the three Maritime Provinces participated. On page 12 is a recipe submitted by Mrs. Lillian Martin, Necum Teuch, Nova Scotia. The recipe Lillian submitted to the Wartime Economy Book of Recipes for 1945 was for Creamed Slaw. Check out the new page I created to hold Family Recipes. Wartime cookbooks put emphasis on substitutions and rationing. Although my parents’ families did not go without many food items because they lived in rural areas where they grew and raised most of their food, others were not as fortunate. Eggs, sugar, honey, butter and other items were in short supply. The first page of Wartime Economy Book of Recipes for 1945 provides tips on how to stretch sugar and butter to make it last longer. In many recipes, molasses was used in place of sugar. The book contains recipes for the usual foods—cakes, cookies, rolls, chowders—and a few unusual—borsht, rarebit, rose hip honey, apple butter. Pasta dishes were not made in my household until the early 1980s, but recipes for macaroni and noodles are included in this book. At times, I find old recipes add too much salt, perhaps to compensate for the reduced amount of sugar, to add flavour. However, the recipes in this book don’t seem to be laden with the white substance that should be consumed in moderation.